Baguette & Round Diamond Wedding Band | Shane Co.
Nine baguette diamonds, at (approx. .30 carat TW) and six brilliant round diamonds, at (approx. .07 carat TW) are beautifully pave set in quality 14 karat white gold in this lovely 3.3mm wide double wedding band. Gemstone Carat Weight :.30 ct. t.w. I fell in love with this wedding band when I saw it in person at one of the Shane Co. stores. I like that it looks like two stackable rings, but it's really just one. Some days I wear the ring with the round diamonds in the middle and some days I wear the baguettes in the middle. 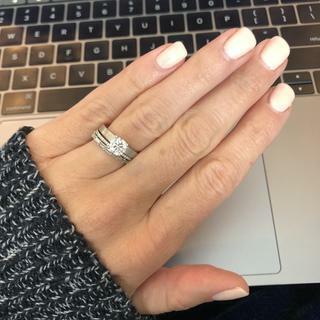 I've worn it for 4 months now and love the way it looks with my engagement ring. My wedding band and engagement ring together.